Fill 5- to 6-quart Dutch oven half full of water. Heat to boiling. Place whole cabbage in water, core side down. Cover; cook 2 to 3 minutes, turning over once, or until leaves can be removed from head. With slotted spoon remove cabbage from water. With tongs, carefully remove 6 leaves from head. Save remaining head of cabbage for later use. Shave or trim part of the thick rib from each leaf. Return leaves to water; cook 2 to 3 minutes or until wilted. In medium bowl, mix ground beef, uncooked rice, 1/3 cup milk, the egg, Worcestershire sauce, 1/4 teaspoon of the salt and 1/8 teaspoon of the pepper. Spoon about 1/3 cup of the ground beef mixture on thick end of each cabbage leaf. Roll up, tucking sides in. Place filled cabbage leaves in 12-inch skillet, seam side down. Add broth and caraway seed. Cover; heat to boiling. Reduce heat; simmer 25 to 30 minutes or until thermometer inserted in center of ground beef mixture reads 160°F. With slotted spoon, place cabbage rolls on serving platter; cover to keep warm. In small bowl, mix 1/2 cup milk, the sour cream, flour, remaining 1/4 teaspoon salt and 1/8 teaspoon pepper with wire whisk. Pour into skillet. Cook and stir over medium heat until thick and bubbly. 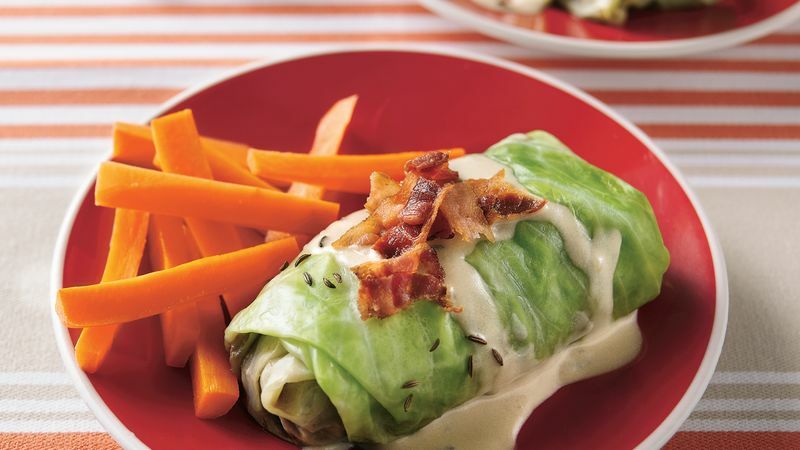 Serve sauce over cabbage rolls; sprinkle with bacon. Shaving part of the thick rib from each cabbage leaf makes it easier to shape the roll. Use the rest of the head of cabbage to make coleslaw. Just cut into fine shreds and mix with your favorite coleslaw dressing.